Attraction Restriction Changes: Alton Towers has recently made changes to attraction restrictions for Congo River Rapids. The minimum rider height remains 0.9m, however riders under the age of 18 must now be accompanied by someone over the age of 18. Take your seats on the Congo River Rapids and ready yourself for a rather wet trip down this majestic river. Just try not to get too distracted from the raging torrents by the sights and sounds, else you might brought back to reality with a splash. On it's journey the raft dips and dives through canyons and tunnels, under bridges and past majestic waterfalls. The river even passes close to the neighbouring Runaway Mine Train. If you're lucky you might catch a train going by! The Congo River Rapids as we now know them were originally opened in 1986 as the Grand Canyon Rapids - carrying a very plain theme and with minimal guest interaction. 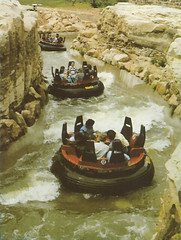 In fact, most of the ride was hidden from guests until you were rafting down the canyons. The ride was constructed over 12 acres that had previously been the coach park and channel required one of the park's largest excavation projects to complete. Rocks blasted from the channel were used to enhance the canyon theming around the ride, whilst the soil excavated was used to create the embankment that separates the ride from the car park. 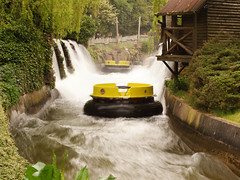 The rapids remained modestly themed until the intervention of John Wardley in 1992 when they were rethemed to the ride we see today with Katanga Canyon built on the island in the centre of the ride. As the rest of the park has expanded, the area around the rapids has remained largely the same other then the arrival and departure of various elements of queue-line theming. But the passing of time has seemingly only improved the antiquated colonial theme though, and on hot days it is not unheard of to see queues of over an hour for this old stalwart.